Night of MuZen ~ Spring Awakening! SPACE IS LIMITED, SO GET TICKETS SOON (below)! 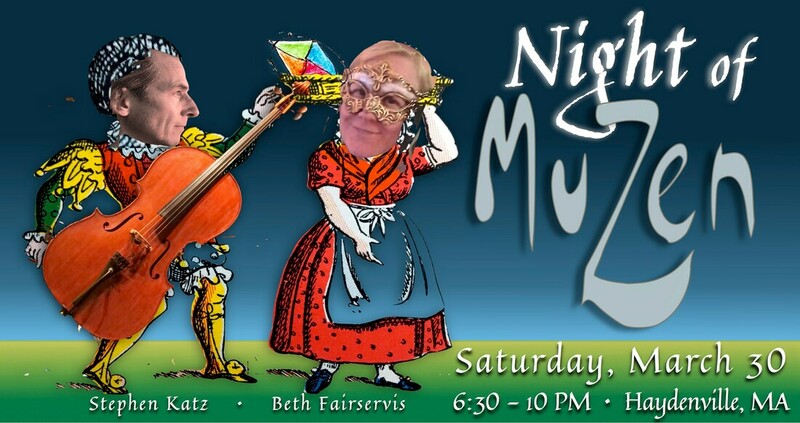 Beth Fairservis and Stephen Katz present another evening of music, theater, puppetry, (not soup, but) fresh bread & desserts. BYOB. Bonfire and dancing to benefit MuZen's ongoing street theater work. ​Paypal will open a new page that will add up your choices below. Join Ebenezer and Florence on their journey across the earth seeking stories from the awakening seeds of Spring! Florence will crank out tales of the land on scrolls of paper, light and prayers, and Ebenezer will serenade dreams and hopes that are putting down roots and sprouting the future of Green! • Say Tender Goodbyes and Plan to Come Again!